Outdoor fire features can warm a cool evening or create magical ambiance on a warm summer night. Choose an outdoor feature that suits your mood! Pictured on left is an Oil Rubbed Bronze wood firepit with a Palm Leaf design. It measures 40" in dia x 25.2" high and weighs 44lbs. 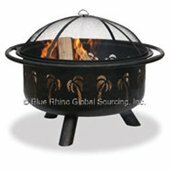 We carry different types, sizes and styles of wood and gas firepits including custom built pits. In store products continually turn over so we recommend you call or visit our showroom to find the one that's right for you. Remember, we can order or, design and build the right firepit for you and your needs. Option: Portable Operated Rotisserie available (Runs 20 hours on 2 D cell batteries) Two 26" Vertical Support Poles with Mounting Brackets (No tools necessary) One 36" Polished Steel Cross Bar with Grizzly Spit-Forks and Canvas Storage Bag. Fire Rings are made of Stainless Steel and are Double Ringed for outdoor firepits, they are available in several sizes. Fire Rings have a 1/2" female receiver with end cap. Round Sizes are: 12", 19", 22", 24", 30", and 36". Custom sizes available. Rectangular Sizes are: 12"X9", 18"X15", and 24"X21". Custom sizes available. Fire Ring Grates are 1/2" round steel. Available sizes are: 12", 19", 22", 24", 30", and 36".